Hot and salted tamarind fruit candy, with real tamarind pulp. Some packages come with a collectible plastic glass. Delicioso Dulce de tamarindo salado y enchilado. 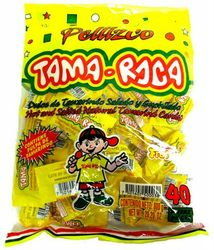 El pellisco contiene pulpa de tamarindo. Algunas bolsas traen vazo de coleccion. My friend gave me a whole bag that her brother got her from Mexico. I absolutely loved them and my coworkers too. The taste is tart with a twinge of hot spice. 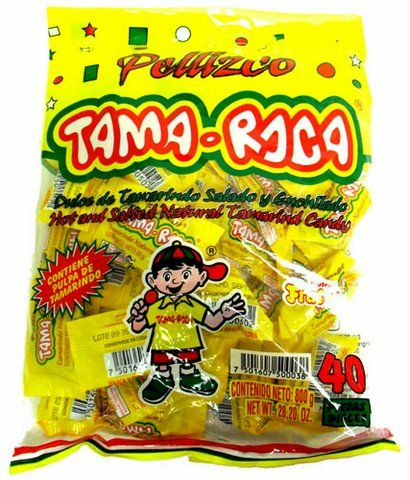 I was brought up with tamarind so the taste is not strange to me.